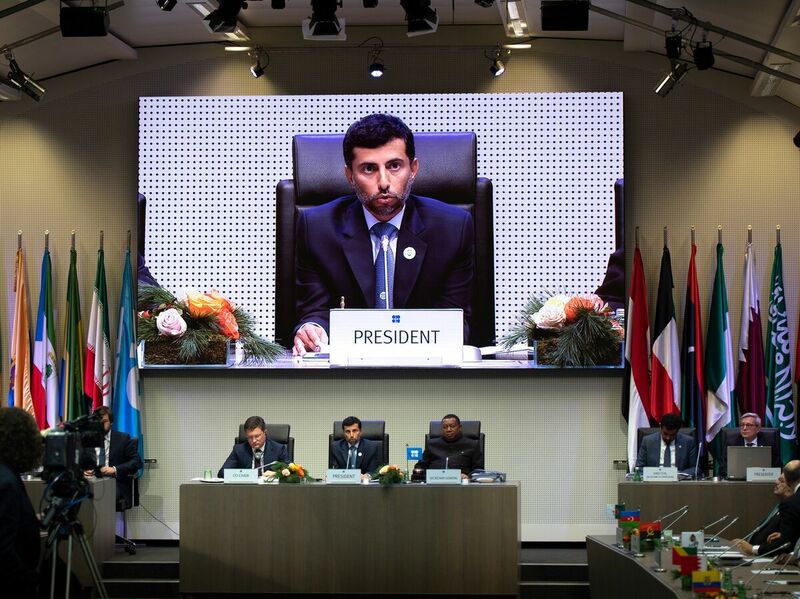 OPEC President Suhail al-Mazrouei speaks Friday at OPEC headquarters in Vienna. OPEC, Russia and other producers have agreed to cut production, ignoring pressure from President Trump. Ignoring pressure from President Trump to keep the oil flowing, OPEC, Russia and other producers have agreed to cut production. They pledged to pare output by 1.2 million barrels a day, hoping to stem a sharp drop in oil prices. The price of crude jumped nearly 4.5 percent Friday morning, to $53.75 per barrel, on word of the agreement, which called for a bigger reduction than analysts had expected. Oil prices had plummeted 30 percent in recent weeks as supplies grew and signs emerged of a slowing global economy. Gas prices have dropped, too. The national average for regular is $2.44 per gallon, down 30 cents from a month ago, according to AAA. Friday’s deal came despite a barrage of tweets from President Trump urging OPEC and Saudi Arabia, its most powerful member, to hold down prices. But OPEC and its partners moved ahead with plans to cut production after meetings this week in Vienna. Iran, under pressure from sanctions, won an exemption from the cut. “OPEC has committed to 800,000 [barrels per day] in output cuts, and 10 non-OPEC producers led by Russia will slash another 400,000 b/d for six months beginning January, under a preliminary deal reached Friday after two days of tense negotiations. OPEC is getting stiff competition from increased oil output in the U.S., which is now producing more oil than any other country. Production in places such as North Dakota is booming, thanks to fracking and horizontal drilling.